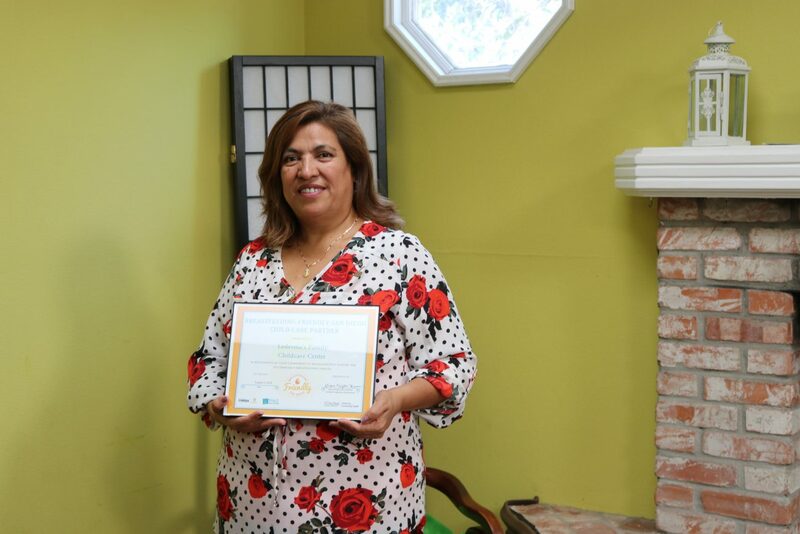 Since 1999, Ms. Ignacia Ledesma has wholeheartedly devoted her time, home, and care to provide childcare services to families at Five Little Princesses. As an avid learner, Ms. Ledesma is always seeking opportunities to enhance the quality of all of the services that she provides to support and contribute to the health and well-being of local families. Five Little Princesses is a proud partner of Breastfeeding-Friendly San Diego (Pro-Lactancia). Ms. Ledesma has seen the benefits of breastfeeding first-hand through her own family, and now a health legacy with her grandchild. Her emphasis on promoting breastfeeding to all women of childbearing age shows the passion, commitment and love that she exudes in caring for families, now for over 19 years of service. At Five Little Princesses Ledesma’s Family Child Care, parents experience a welcoming place, a well-organized spacious home, where children have nutritious meals and enjoy fun activities with their fellow playmates. Ms. Ledesma bolsters children’s sensory and motor skills, as they learn the art of sharing and socializing with other children. Join us by welcoming another provider investing in the future of our communities’ health. We thank Five Little Princesses Ledesma’s Family Child Care for the great family childcare service they provide and we congratulate them on becoming a Breastfeeding-Friendly San Diego (Pro-Lactancia) Partner! Desde 1999, la Señora Ignacia Ledesma ha dedicado su tiempo, hogar y cuidado incondicional para proveer servicios de cuidado de niños a las familias en Five Little Princesses. La Señora Ledesma es una aprendiz ávida, que siempre busca oportunidades para mejorar la calidad de todos los servicios que provee para contribuir a la salud y bienestar de las familias locales. Por esa razón, Five Little Princesses es una socia orgullosa del programa Breastfeeding-Friendly San Diego (Pro-Lactancia). La Señora Ledesma ha visto los beneficios de la lactancia materna de primera mano por medio de su propia familia y ahora su nieto. Su énfasis en promover la lactancia materna a todas las mujeres de edad reproductiva, demuestra el ímpetu y el cariño que emana al cuidar a todas las familias durante sus 19 años de servicio. En Five Little Princesses Ledesma’s Family Child Care los padres entran a un lugar acogedor y un hogar bien organizado donde los niños tienen comidas nutritivas y disfrutan de actividades divertidas con sus compañeros. La Señora Ledesma se asegura para que sus niños continúen desarrollando sus habilidades sensoriales y motoras mientras aprenden el arte de compartir y socializarse con otros niños. Acompáñenos a darle la bienvenida a otra proveedora invirtiendo en el futuro de nuestras comunidades. Les agradecemos a Five Little Princesses Ledesma’s Family Child Care por el gran servicio de centro de cuidados de niños que provee a las familias y la felicitamos por convertirse en socia de Breastfeeding-Friendly San Diego (Pro-Lactancia)!